Home Food The SECRET to Tasty Claypot Rice! They say a magician will never reveal his/her greatest trick. To many, what Chef Sheng Li can do with his signature claypot rice is nothing short of magical and few can resist the smoky savouriness of Yi Pin Ji’s Chicken Claypot Rice. Unlike the other magicians of the world, Chef Sheng Li likes to share, in this article he reveals his secret tips and tricks to create his signature dish! One of the most crucial part of the Claypot Rice, is the chicken. Why does it taste so good? Hard laborious work! 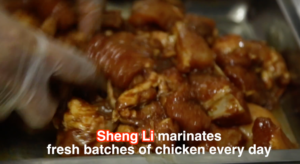 Chef Sheng Li marinates fresh batches of chicken by himself. How often does he do it? Every single morning! Chef Sheng Li arrives early every single morning to marinate the chicken by hand, using only the best Hua Diao Wine! Other than the best Hua Diao Wine, Chef Sheng Li has to use other impressive ingredients to achieve the taste that so many of his customers love. 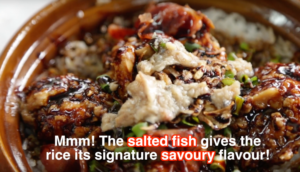 One of the most important ingredient is Mei Xiang Xian Yu (Salted Fish). It is this salted fish which gives the rice it’s classic savoury flavour. To top it all off, the dish is served in a traditional claypot giving it its smokey flavour! 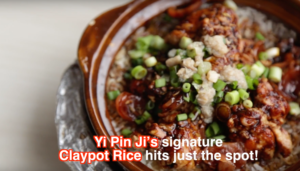 Yi Pin Ji ‘s Claypot Rice is a must try! Now that you know the secrets, you may want to try it out yourself. But before cooking your very own, head down to Yi Pin Ji to have a taste! You will not regret this delicious hearty meal! Next articleBreathe Easy, Live Well! Ceiling Fans are the answer!